Miss Edith told me of the worry that you are having about the alleged accident near your property on 13th Street. Of course, you have not asked me for any advice, but I am so interested that you will understand why I mention the subject. It seems a lot to pay for the carelessness or, negligence of a corporation paid to manage your affairs, and from what I hear it seems the case ought to be settled for much less. If you are so situated that you cannot do otherwise than take the advice of those who have advised you to pay the $100000, then very well; but if you are free footed to let me see if a better settlement cannot be made, then I will be glad to see what can be done. 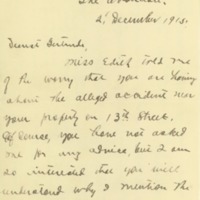 You would not, of course, want me to be active in the matter, but my acquaintance is so wide with lawyers here in whom I have absolute confidence, and who would do all that is humanly possible to make a good settlement for you that I am hoping, if you have not committed yourself, that you will let me see what can be done. But anyway, dear little sweetheart, don’t worry, and remember that I love you as devotedly as ever a man loved a true, sweet girl—when trials, whether big or little, come into our lives, our love that will always last will make us laugh them away. Grayson, Cary T. (Cary Travers), 1878-1938, “Cary T. Grayson to Alice Gertrude Gordon Grayson,” 1915 December 2, WWP20910, Cary T. Grayson Papers, Woodrow Wilson Presidential Library & Museum, Staunton, Virginia.